Hans Holbein the Elder (c. 1460 – 1524) was a German painter. 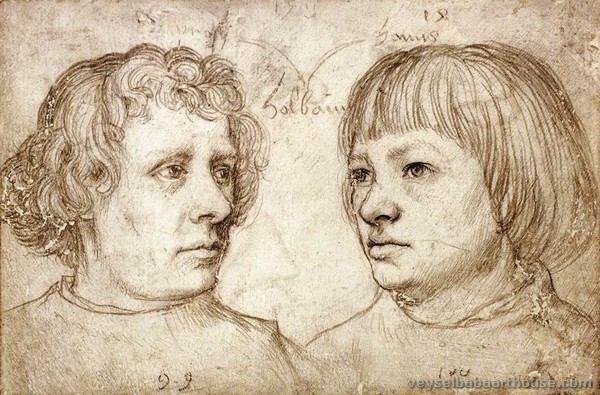 Holbein was born in free imperial city of Augsburg (Germany), and died in Isenheim, Alsace (now France). He belonged to a celebrated family of painters; his father was Michael Holbein; his brother was Sigmund Holbein (died 1540). 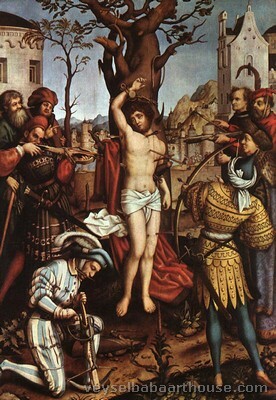 He had two sons, both artists and printmakers: Ambrosius Holbein (c. 1494 – c. 1519) and Hans Holbein the Younger, (c. 1497 – 1543), who both had their first painting lessons from their father. 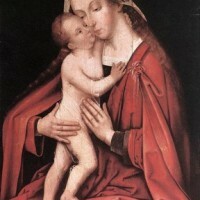 The date of Holbein's birth is unknown. His name appears in the Augsburg tax books in 1494, superseding that of his father. 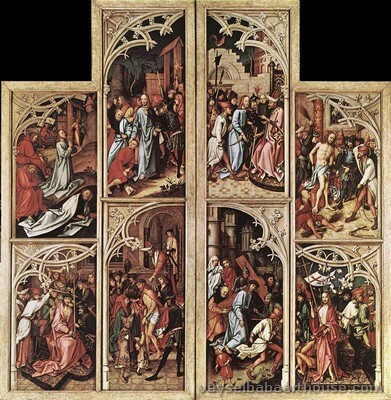 As early as 1493, Holbein had a following, and he worked that year at the abbey at Weingarten, creating the wings of an altarpiece representing Joachim's Offering, the Nativity of the Virgin Mary's Presentation in the Temple, and the Presentation of Christ. 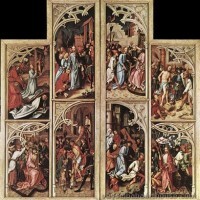 Today they hang in separate panels in the cathedral of Augsburg. 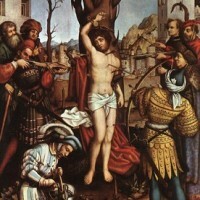 Holbein painted richly colored religious works. His later paintings show how he pioneered and led the transformation of German art from the (Late) International Gothic to the Renaissance style. 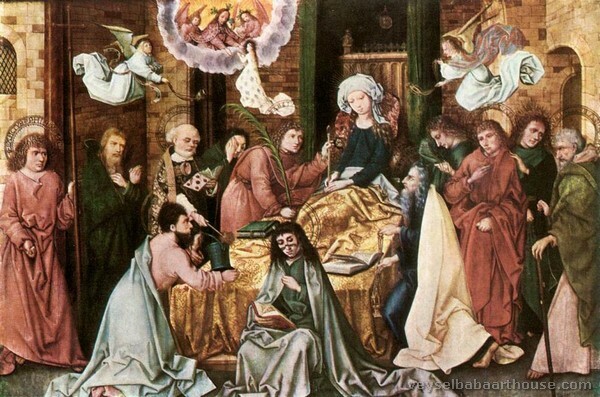 In addition to the altar paintings that are his principal works, he was a woodcut artist, an illustrator of books, and a church window designer; he also made a number of portrait drawings that foreshadow the work of his famous son, Hans Holbein the Younger. 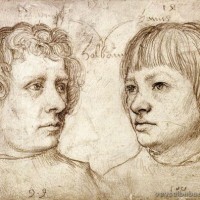 Holbein first appears at Augsburg, partnered with his brother Sigismund (who died in 1540 at Bern, Switzerland). Augsburg, at the time of Maximilian I, Holy Roman Emperor, cultivated art with a Flemish style, and felt the influence of the schools of Bruges and Brussels, even though it was near Italy, with close commercial connections to Venice. 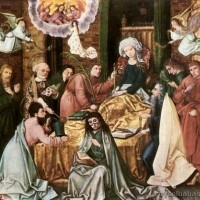 Sigismund was also a painter, but Hans had the lead of the partnership and signed all the works they produced. After 1516 Holbein was declared a tax defaulter in Augsburg, which forced him to accept commissions abroad. 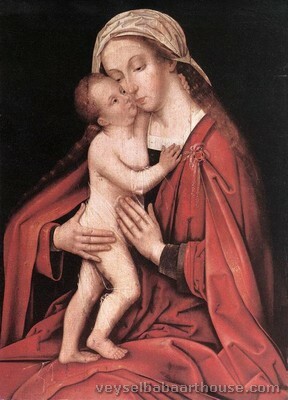 At Issenheim in Alsace, where Matthias Grünewald was employed at the time, Holbein found patrons and was contracted to complete an altarpiece. His brother Sigismund and others sued him in Augsburg for unpaid debts. Pursued by Augsburg authorities, he fled Issenheim, abandoning his work and equipment, and went to Basel. He died two years later at an unknown location. After 1524 his name no longer appeared on the register of the Augsburg guild.